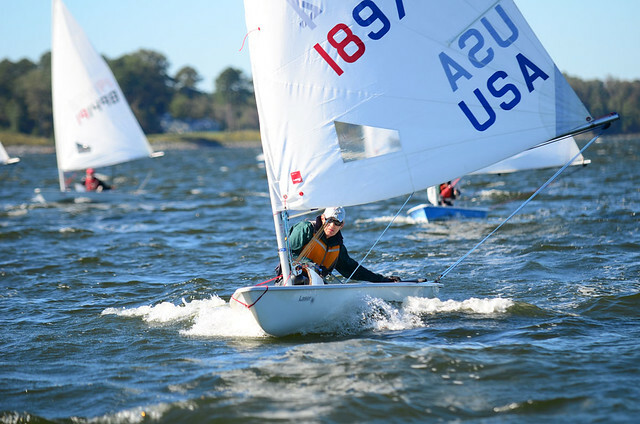 Mother nature delivered again with 20+ knots of wind for 3 long races on the first day of the 30th Chesapeake Bay Laser Masters Championship. Magothy River Sailing Association sailor Mike Schmidt leads the regatta after the first day with a 4-2-1 on the day. David Schoene from Severn Sailing Association is currently in 2nd and Keith Davids from Mission Bay Yacht Club is in 3rd. With the winds we had today and memories of gusts into the 30’s on day 1 last year, most of the fleet opted to the sail the radial rig under the rig swap rule that allowed radials to sail head-to-head against the standard rigs. The radials did remarkably well taking 13 of the top 20 places. Tomorrow’s forecast calls for a little lighter winds for most of the day. We hope to get in another 4-5 races.